After over four years of squalid captivity, the infamous dandy Sebastian O escapes from Bedlam Asylum, determined to seek revenge for the treacherous destruction of his Club de Paradis Artificiel, an association of “free-thinkers.” Battling officers of the Queen and crazed assassins alike, Sebastian makes his way through several wardrobe changes and the sewers and railways of an alternate Victorian England, where a strange conspiracy is beginning to make itself known. Sebastian O is one of the earliest contemporary steampunk creations, as well as being an obvious tribute to Oscar Wilde. Not surprisingly, it’s also one of my absolute favorite comic series – I love sneaking re-reads of it whenever I’m feeling down and in need of some amoral, witticism-wielding libertines in my life. 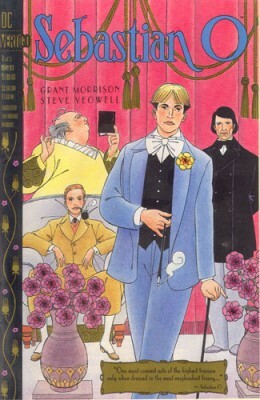 Unfortunately, it’s quite short – only 3 issues – and though Grant Morrison does excel at packing a lot of content and tight plotting into his mini-series, you’re left wanting much, much more of the characters and settings, all of which are colorful and vividly imagined. On top of that, it’s out of print, though used copies run cheap. Artwise, I’m lukewarm on Tatjana Wood’s pastel palette, but it does work with Yeowell’s delicately lined, Beardsley-inspired art – one gets, appropriately, the sense of a brittle confection of spun-sugar. I also enjoy how Yeowell renders facial expressions, particularly Sebastian’s perpetual air of weary self-possession and amusement just a little too slight to be called mockery. All told, Sebastian O is a perfectly paced, literarily aware romp through decadence and dandisme, full of gadgets, duels, one-liners, and speculative-fiction braincandy. I would love to see a full-length return to Sebastian’s London, but unfortunately, it looks unlikely to happen. Oooh, you know, I’ve seen this at the library, and I think I’m going to have to check it out. Sounds like my kind of thing. That is one well-stocked library! It makes my day when public libraries have mildly obscure graphic novels.